Systemic lupus erythematosus (SLE) is a chronic inflammatory autoimmune disease that can affect any part of the body, including the skin, liver, kidneys, and blood. Thrombosis is a frequent manifestation in SLE, contributing significantly to patient morbidity and mortality, although the precise mechanism(s) of how this occurs remains unclear. Fibrinolysis is the physiologic process of thrombus digestion and provides an important balance to hemostasis. This process is triggered upon vessel injury with the release of tissue-type plasminogen activator (t-PA) from endothelial cells. 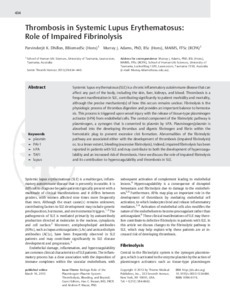 The central component of the fibrinolytic pathway is plasminogen, a zymogen that is converted to plasmin by t-PA. Plasminogen/plasmin is absorbed into the developing thrombus and digests fibrinogen and fibrin within the hemostatic plug to prevent excessive clot formation. Abnormalities of the fibrinolytic pathway are associated either with the development of thrombosis (impaired fibrinolysis) or, to a lesser extent, bleeding (excessive fibrinolysis). Indeed, impaired fibrinolysis has been reported in patients with SLE and may contribute to both the development of hypercoagulability and an increased risk of thrombosis. Here we discuss the role of impaired fibrinolysis and its contribution to hypercoagulability and thrombosis in SLE. © 2013 by Thieme Medical Publishers, Inc.